Watercress (Nasturtium officinale) is a wild relative of cabbage and broccoli that grows in clean, fast flowing streams. It is a popular soup and salad ingredient in Mediterranean cooking thanks to its tangy, peppery leaves. Recent studies have discovered that eating watercress regularly may prevent several different forms of cancer. The research is convincing enough to make watercress an essential food for everyone. It may be especially important for people, such as smokers, who are vulnerable to cancer. Watercress was so highly valued by the Ancient Greeks that Hippocrates, the father of modern medicine, chose to put his hospital next to a stream full of watercress. In recent times it has often been relegated to the status or garnish or minor salad ingredient. If its anti-cancer properties are confirmed, watercress will be getting star-billing on menus all over the world. A 2014 study by the University of Southampton found that a chemical in watercress called phenylethyl isothiocyanate stops breast cancer in its tracks. It blocks the formation of new blood vessels and thus prevents tumours from getting nutrients and expanding. One-in-nine western women develop breast cancer so watercress may have the potential to save thousands of lives. Further good news about this humble aquatic plant came from a 2014 study published in the American Journal of Clinical Nutrition. 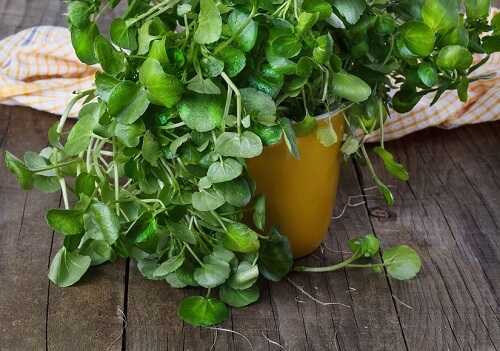 It discovered that consuming watercress lowered DNA damage and thus the risk of cancer. It also made cells more resistant to future DNA damage. Both these studies tested the actual effects of eating watercress rather than using chemicals in a test tube. They both found that a serving of over 80 grams of watercress a day is enough to see a beneficial effect. Further independent studies involving larger groups of people are needed before watercress’ properties are confirmed. In the meantime it is definitely worth including watercress in your diet just because it is delicious, low in calories and full of Vitamin A, Vitamin C and iodine. To increase the amount of watercress in your diet use its tender leaves in a salad along with raw beetroot. Season with sea salt and freshly ground pepper and drizzle with lemon juice and extra-virgin olive oil. Raw watercress goes very well with oily fish such as mackerel and always livens up a boring garden salad. You can also make a tasty soup out of a large handful of watercress leaves and stems, an onion and a potato. Garnish with fresh leaves and a swirl of sour cream and you have a healthy and highly nutritious salad. Do you use watercress in your meals?